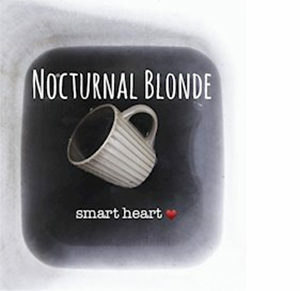 As their bio states, Nocturnal Blonde was “originally created as a project to bring about awareness, in story form, to mental clarity and substance abuse.” The 5 tunes on their Smart Heart EP do reveal a certain approach to looking at the world in such a minimal and reflective way. Opening with the halting guitar pluck of “Drained,” into the all-too-short, and wonderfully torchy “All Those Angles,” things get going here for sure on the wonderful “Blown Away.” Singer Rachel Adams using her warble to its finest, guitarist Ritchie Williams striking nice jangly electric guitar cords, light piano in the background, and drummer James Owen providing a tom, snare rhythm. This is a great tune to be sure and I would have loved more like this, fully realized. I get what the band is going for here overall, but less is not always more. “Two Trees” has some sweet string work around the acoustic guitar and piano and a very sad lyric delivered by Adams. And the EP’s title track “Smart Heart” ends the whole concoction. It features a vocal duet of Ritchie Williams and Adams, lots of space of just a bass drum behind them, and then, so subtly, Kevin Sims tickling in some sliding big bass notes at just the right time. Again, less is more? Not sure. Athens, Georgia’s Nocturnal Blonde certainly deliver on their Smart Heart. I’m just not a big fan of the production at all times.